There is a small voice within each of us that always knows exactly what we should (or shouldn't) do. In Tarot, this voice is represented by The High Priestess. Her knowledge comes from an intuitive place (most commonly felt in the gut or heart), and not from the brain, so perhaps this is why it can be so difficult to hear her message. From a young age, most of us are schooled to reason and analyse - we become thinking machines, with years of our lives spent learning to rationalise and calculate things that could be more effectively worked out by a computer. We are rarely taught to look within ourselves for the answers to anything. So by the time we are adults, we continue to ignore any whispers we may hear - we have either become unintentionally deaf to them, or when they manage to trickle through to us, we often choose not to hear what is being said, through fear or distrust. With society putting so much value on intelligence, logic and understanding, even when we hear the voice within, we are not used to overriding logical thinking with unquantifiable / unproven 'feelings'. Whispers are always messages, and if you don't hear the message, the message turns into a problem. And if you don't handle the problem, the problem turns into a crisis. And if you don't handle the crisis, disaster. Your life is speaking to you. What is it saying? How many times in your life have you had a gut feeling about something, and ignored it? How often did you regret it? When have you risked over-riding a logical decision with one that just 'felt' right? How did that work out for you? When the High Priestess shows up, it's time to look within and to tune in to what's there. Centre yourself and get present. What is your gut-feeling telling you? How can you learn to tune into your inner wisdom on a more regular basis? 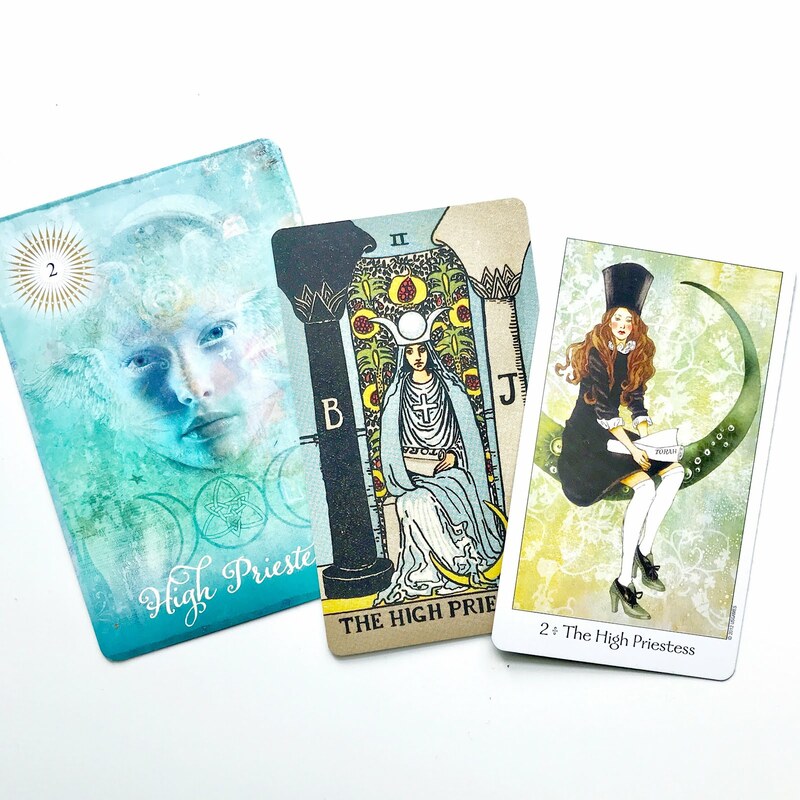 Over the last 24 hours The High Priestess has popped out of these three different decks - definitely time to meditate on what it is I need to know!